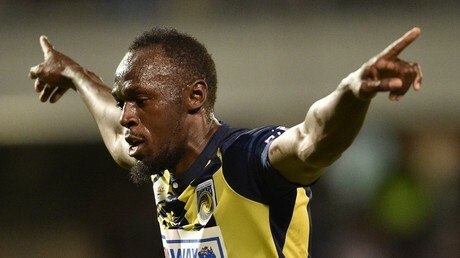 World’s fastest man Usain Bolt has bagged his first goals as a footballer for Central Coast Mariners with two goals during a friendly match as his trial period for the Australian A-League side continues. The 32-year-old’s hopes of clinching a full-time footie contract down under were boosted when bagged a double against Macarthur South West United on Friday. His first came by scoring 10 minutes into the second half with a left-footed finish after shaking off a defender. The goal was marked in a style only he could muster – by striking the famous ‘lightning bolt’ pose usually reserved for track victories. His second came in slightly more fortuitous circumstances as a defensive mixup between keeper and defender saw the ball fall to Bolt, who rolled the ball home into an empty net, before being taken off on 75 minutes. Jamaican sprint legend Bolt, who still holds the current 9.58 seconds world 100m record, called time on his track career in 2017 and since has cosistently made mention of his intentions to embark on a professional football career. There were rumors Bolt could have made an appearance for English Premier League club Manchester United, largely eminating from the man himself and owing to his professed love of the club. In August, Bolt made his debut for the Mariners, coming off the bench during a 6-1 pre-season rout against amateur outfit Central Coast Select.